The refractory metals such as tungsten are superior as contact materials, not only as far as temperature resistance and resistance to mechanical wear concerned, but also in regard to the detrimental effects of arcing. The copper tungsten grades for contact metals are Vaculoy CT60, CT70, CT75, CT78 and CT80. This range of compositions will cover most applications for acing contacts in air blast, oil immersed and SF6 gas circuit breakers. The higher the conductivity grade Vaculoy CT60 is also for onload tapchanger contacts operating in oil. The three grades of silver tungsten will cover most applications for arcing contacts in switchgear, control gear and circuit breakers operating in air or cells switches operating in chemical atmospheres. The Company is one of the leading UK manufacturers of Tungsten based Electrical Contact Metals having over thirty years experience in the manufacture of high quality materials. During this period we have supplied the following. Medium to High Voltage switchgear contacts. 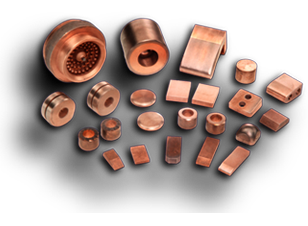 Tungsten Copper electrode materials for electro discharge and electro chemical machining. The company works to exacting standards with strict procedures to ensure the high quality of our product. In support of this we are currently working towards ISO9002 qualification. 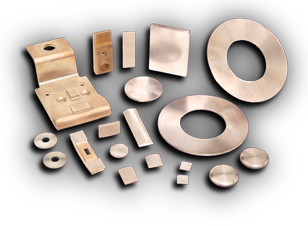 The VI Products Web Site features our services as manufacturers of Electrical Contact Metals. Here at VI Products, we are one of the leading UK manufacturers of Tungsten based Electrical Contact Metals, including copper tungsten and silver tungsten. 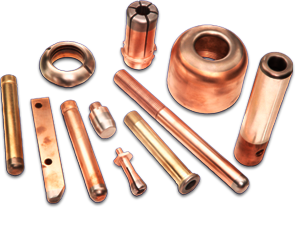 The copper tungsten grades for electrical contact metals are Vaculoy CT60, CT70, CT75, CT78 and CT80. The Site shows the three grades of silver tungsten which will cover most applications for arcing switchgear contacts, control gear and circuit breakers. Within this website you will find information relating to Medium to High Voltage switchgear contacts, Resistance welding electrode materials, tungsten copper, electrode materials for electro discharge and electro chemical machining, switchgear contacts, welding electrodes, semi conductor heat-sink bases, ECM and EDM electrode metals. For all enquiries relating to electrical contact metals please call 01925 817213 or use our online contact form within the contact section of our website.